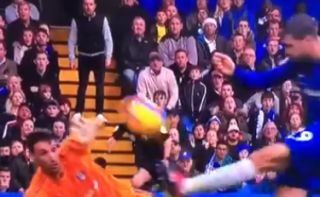 Alvaro Morata had another awful moment in front of goal today in the Chelsea vs Fulham match at Stamford Bridge. With the Blues 1-0 up from Pedro’s early strike, they could really have done with another just to settle the nerves in this London derby. However, with the goal gaping, Morata failed to put away a rebound when it looked easier to score.